Those living in the States might take it for granted that they can go into a store and buy an Apple iPhone 4S. Believe it or not, there are some countries where you cannot find the latest version of Apple's iconic smartphone for sale. However, that number was reduced by 20 on Friday as that many countries launched the iPhone 4S. 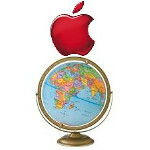 According to MacRumors, those locations are: Bahrain, Brazil, Chile, Egypt, Israel, Jordan, Kuwait, Malaysia, Morocco, Peru, the Philippines, Qatar, Russia, Saudi Arabia, South Africa, Taiwan, Thailand, Tunisia, Turkey, United Arab Emirates and Vietnam. Prices for the Apple iPhone 4S are all over the place in the 20 new countries where it can be bought, The highest priced units are in Brazil where the 16GB model goes for the equivalent of $1,410 USD. The 32GB and 64GB variants of the iPhone 4S go for $1,628 USD and $1,845 USD respectively. People in countries like Malaysia, Taiwan, Thailand, and the United Arab Emirates are offered the phone from Apple directly online. Pricing is more in line with what is seen in the States. In those aforementioned countries, the Apple iPhone 4S costs around $700/$800/$900 for the 16GB/32GB and 64GB models in those markets, respectively. Pricing for unlocked, contract-free Apple iPhone 4S models in the U.S. weighs in at $649/$749/$849. And there was a 700 people line in one of the stores. People can say many things about the iPhone. But IMHO no phone is worth a 10 hour wait or 1410 dollars. Can you guys believe the first guy on the line compared the feeling to winning a swimming highschool state championship? He waited 10 hours in line WITH his mom and she helped him pay since he didn't have enough money. That was a 10 hour wait to try Siri for 1410 $... And not actually use it as it doesn't understand their language :-/ Apple should request to be registered as a genuine religious community. Apple is God. That's the only explanation i have for such blind faith and worship. Nope you don't understand it. lukasound. "Apple is God -> only explanation for blind faith and worship." (What does this has to do with siri, siri-ously?) Gallito is talking about look at so many fans waiting for the last Harry potter film, twilight and the Star wars fans. It's not blind faith and worship. Ask those people for example why are they wanna be at the premiere of Harry Potter? Because they love the movies and books? yeap. Yep. That's true. But loving so much something to the point of doing such extreme things isn't almost as worshipping? We, regular fans would just wait a couple of weeks and buy without too much hassle. Man, did I feel stupid and angry to stand in line since 6 am to buy an iPad 2 for my brother in my last trip to USA. At least now he wants the gtab 7.7, after owning a GSII. I don't know but I don't got that problem in my country. But it still is very populair. I don't have to wait that long to queue for a device. I think most people are jealous that people are queueing for apple products instead of androids for so long. And then those people talk about they know why they queue that long: it are apple fan boys who have blind faith. Not really if you just got an ipad 2 then it doesn't mean you're a fanboy. But yeah i agree their products are pretty populair. Some people are jealous? Most certainly. Most people? I don't think so. Everyone in my circle of friends and family, Apple and non-Apple users, agree that it is kind of crazy and depressing. We joke a lot about it. I think it's just sad that waiting in line for hours and buying an overpriced iPhone (the 1400$ one, I'm not generalizing) can be a highlight of someone's life, to even compare it to winning a swimming medal. This world is turning upside down. gallito, for many people Apple has taken the place of organized religion. They have had many studies that have shown that apple ignites the same areas in the brain as a devout religious person in ceremony. And yes, there are definitely people from the potter, twilight, star wars camp that fit in that category too. But there is no other electronics company that gets such blind fanaticism. I think its safe to say we have a few of those religious apple fanatics on the boards. I don't know remix. Religion is one of the reasons why people hate apple. Yes I agree that there are people who're blind fanatic and yes on both sides. And that those apple fanatics make a religion of it. "oh god, apple invented multitouch". We both know this isn't true. But that apple is almost a religion doesn't mean, you shouldn't buy their devices. But yeah from a certain point of view other things looks like a religion also. maybe, first it's not a reason to dislike apple (many people do) second that doesn't mean everyone who goes to an apple store is an apple fanatic who thinks it's a religion. But I'm sure other people can have this to about other products. lol, i never said "everyone". But there is a much higher instance of it with apple than with any other brand. There are always fanatics. its probably similar to sports junkies n such. like someone who decorates their house in their team colors, gets painted up for games, and tailgates for hours. But again, its more so with apple than with any other brand.. by far. I agree this is overpriced. But why is it overpriced? The handsets are most likely made in China and imported into Brazil, and the country applies very high taxes to imported electronics thus, the unavoidable price hikes. Apple is working on it. Once the iPhones “Made in Brazil” begin to ship, Brazilians should see those sky-high price points drop. For the brazilian PA readers I should say: just wait. The prices will drop but I can guarantee not that much. Taxes here are high even for non imported products. A car assembled in Brazil still costs more than twice than the same model made in Europe or USA. I usually buy electronics when I visit USA on vacation or have someone I know bring to me. Almost everyone I know goes there to make some shopping. Another example is our Big Mac. If I'm not mistaken we have the most expensive Big Mac (yep the sandwich) in the world. While China's is the cheapest. And Apple stuff is still very expensive in China. Believe it or not the prices in Brazil will drop. Once the iPhones "made in Brazil" begin to ship. This means that the iPhone will be made in Brazil so they're not so depenting on the high taxes and to import it at high prices. Maybe the iPhone is still expensive in China, but of course there will be other reasons. My comment was for the Brazilian PA readers (if they exist). I'm from Brazil. Can you believe that made in Brazil stuff is cheaper in our neighbour country Paraguai? Yep. Our taxes are that high. Thank you for having a civilized discussion! you would think if you were really in braZil, you would at least spell your country right. yup, in spanish is brasil too. French is bresil and italian brasile. I believe all latin-derived languages use the S.